New listings get a 10% discount! 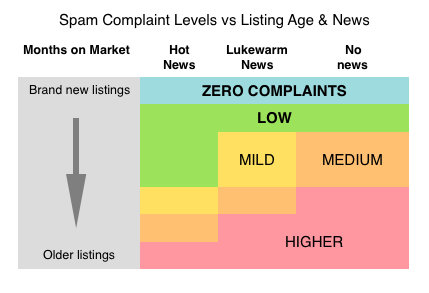 After sending, measuring, and analyzing double-digit millions of flyers, here is a summary of how spam complaints change with listing age, and news. That's why a discount is offered to new listings. And from time to time we automatically apply other discounts to other types of flyers, such as for brokers open events. Market Age is how long the listing has been publicly offered. It includes delisting periods shorter than 60 days (because agents do not tend to consider a brief delist/relist to be 'new news'). 'Hot' News is announcing an upcoming weekday broker-only event, or a price change of 1% or more within the past 3 days. 'Lukewarm' News is announcing a price change of 1% or more within the past 4-14 days. Weekend / public open house events or agent bonuses are good to mention on your flyer, but do not tends to affect spam complaint levels.